On Sunday August 25th, St. Peter’s Church of Coupland will be celebrating the 60th anniversary of the Ordination of Pastor Emeritus Jewel Johnson. A “must make it” Sunday! There will be special music from the family during the worship and a potluck meal afterwards. Mary and Jewel are also celebrating their 65th wedding anniversary and would like to invite all to come join them! Cake and drinks provided. Spread the word and encourage all to be there. What a special privilege for us to share this moment! Church service starts at 10:15. Publisher’s Note: Jewel Johnson is the author of “A City on a Hill,” which is a history of Coupland and of St. Peter’s Church and which is being presented, in serial fashion, in these pages. Prissy Rumel is the daughter of Jewel and Mary Johnson. She submitted the following biographical information to the Coupland Times. Jewel Johnson was born August 24, 1926 the third of four boys. All four served during WWII. Jewel dropped out of school at age 16 and worked as a brakeman and switchman on the Illinois Central Railroad until he was drafted into the Navy on Dec 1, 1944. In training he received notice that his older brother, John Henry, a paratrooper, had been killed in Belgium. Jewel served in the pacific on the USS Biloxi. After atom bombs were dropped, his ship picked up released American prisoners of war and took them to San Francisco. On the return for another load the sailors were allowed to go to shore and that’s where Jewel witnessed the complete destruction of Hiroshima. Released from the Navy on June 1, 1946 he returned to Cairo. He got his GED and started college and studied for the ministry at Taylor University, Upland, Indiana. 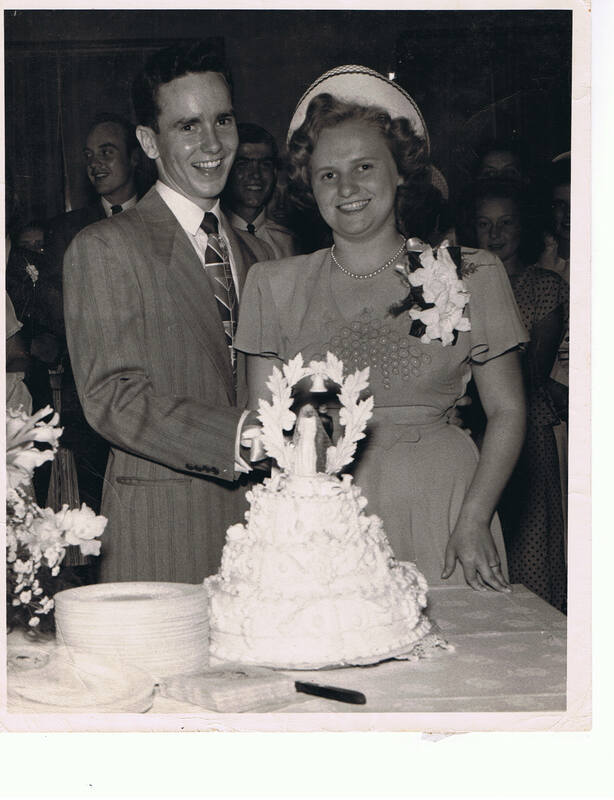 On Aug 16, 1948 he married Mary Elizabeth Wissinger and moved to Carbondale, Illinois to study at Southern Illinois University and be a student pastor to three small churches, Walgonville, Woodland, and New Shiloh, until he graduated on June 11, 1950. He entered Perkins School of Theology at Southern Methodist University in Dallas and as his student charge he lived and served at Round Grove Evangelical and Reformed Church outside of Louisville, Texas. He completed seminary and was ordained at the First Methodist Church at Mt. Carmel, Illinois on May 24, 1953 and was assigned to become pastor of Methodist churches at Hutsonville and Gordon in Illinois. He then returned to Texas in 1955 to pastor St. Peter’s Church in Coupland, moved to Burton in 1959, and then to Church of the Master in Dallas from 1965-1968. He returned to St. Peter’s in Coupland in 1968 and stayed until 1981. He and Mary moved to Nebraska to serve UCC churches in Hyannis and Ashby until 1985. When he returned to Texas he served at St. John’s UCC, Richland and then retired in 1989. After retirement he served Trinity UCC in Niederwald from 1990-1994. This entry was posted in Social, St. Peter's Church, Wayback Machine, What's New?, WHO is That? and tagged A City on a Hill, Coupland Texas History, Jewel R. Johnson, St. Peter's Church of Coupland Texas on August 21, 2013 by Stewart Dale Spencer. Publisher’s Note: When the series is complete, we will make a PDF copy of the entire booklet available to download. This entry was posted in Wayback Machine and tagged A City on a Hill, Coupland Texas History, Jewel R. Johnson on August 14, 2013 by Stewart Dale Spencer.